This villa has some of the most beautiful ocean views on the island. 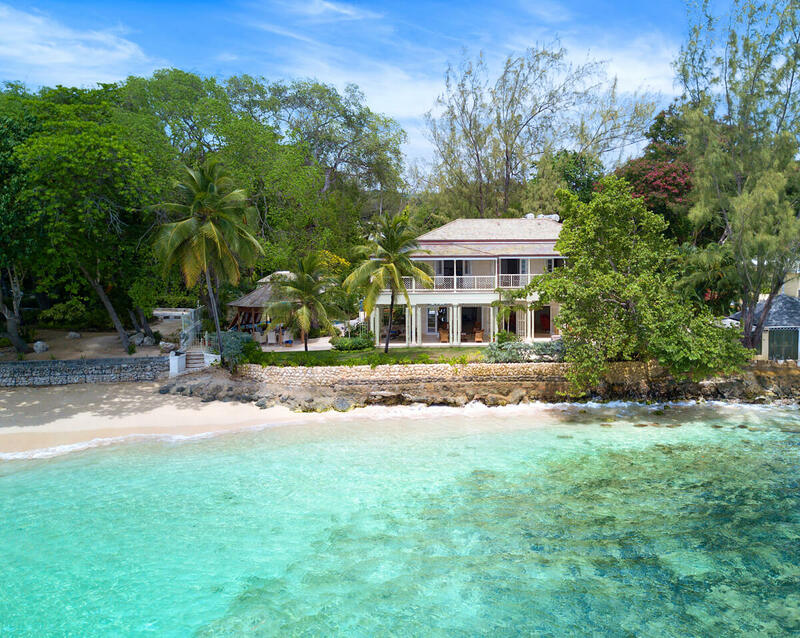 It’s a few steps from the water, perched right on Mullins Beach, and the water is crystal clear, so you can see the reef and sea life from your back door. The villa’s own cook will prepare tasty meals that you can enjoy on the large beachside patio. Since the ocean is literally steps away, you can lounge in the sun or take a cool dip in the sea any time you want. Gibbs Bay is also close, if you want to explore another beach! Hemingway House sits a yard from the sea on Mullins Beach, with surrounded by gardens and the sea for maximum privacy. Nothing feels crammed in this spacious and sunny villa. Outside, the terrace has several trees that shade the lounging chaises around the pool. The large, freeform pool borders the gazebo and is partially enclosed by a Bougainvillea rock wall. The poolside gazebo has a marble dining table with an up close and personal ocean view, and a ceiling fan helps cool the space. An elegant covered pavilion to the side has a wrought iron design that creates an open-air feel. There’s outdoor dining and living areas on this pavilion, all of which open to the main living and dining space inside the villa. A short staircase leads guests down to their own slice of Mullins Beach, which has white sand and crystal clear water. Hemingway House comes with a cook, housekeeper, and laundress. The living room has a large flat screen TV and several armchairs, and the dining table nearby seats 8. The gourmet kitchen has sleek finishes, stainless steel appliances, a coffeemaker, and an oversized prep island with barstools. Every appliance is state of the art, and there’s a walk in pantry that can hold enough food for any feast. Next to the kitchen, a fully equipped bar has two wine coolers so guests can store wines at different temperatures. This main common area is on the ground level of the villa. Each of the four bedrooms has interior access, exterior access, and a TV. The garden bedroom overlooks the pool on the ground level, and has a king bed, fully marbled ensuite bathroom, and a private terrace. The remaining three bedrooms are on the upper level. The Master Suite spreads across the sea-facing side of the upper level, with an ensuite bathroom, king bed, dressing area, and a separate study. The suite also has a private wrap-around balcony with ocean views and plush furniture. The second upper level bedroom is adjacent, with a walk-in dressing area, queen bed, and it’s own balcony. The ensuite bathroom has a shower and bathtub. The third upper level bedroom has a king, a private balcony, and an ensuite bathroom. Hemingway House is ideal for a large family or group of friends who want a beachfront retreat and luxury amenities. Mullins Beach is developed and has several popular beach bars and restaurants. Gibbs Bay is nearby, and is well-known for its calm waters and peaceful atmosphere. Lagoon style: For child protection there is a wrap around pool protector available onsite. Transfers are not included in the rate.